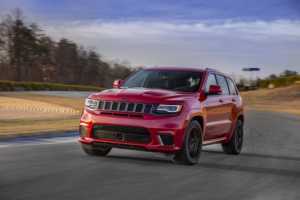 The most powerful SUV ever has been revealed: the Jeep Grand Cherokee Trackhawk! The pulse-raising performance comes from the supercharged 6.2L V8 under the hood that delivers an impressive 707 horsepower and 645 lb/ft of torque. The V8 uses a 2,380cc-per-revolution supercharger with integral charge-air coolers & an integrated electronic bypass valve to produce the power. The forged-steel crankshaft has induction-hardened bearing surfaces to withstand nearly 1,600 psi, which is nearly equal to 5 family sedans. We already spoke about the Trackhawk’s exclusive engine, but there are other technologies used to give you an exhilarating drive. For starters, the TorqueFlite 8-speed automatic transmission has been specially tuned for the V8’s higher torque capacity and provides improved shift response. When putting the pedal to the metal, sometimes you need to stop suddenly because of other drivers on the road. That’s where the high-performance Brembo brakes come in to help you stop quicker. These brakes measure 15.75” up front and 1378” in the rear. Of course, the Trackhawk is still a Jeep that’s made for going off-road. This model uses tech like Bilstein adaptive damping suspension and Jeep Quadra-Trac on-demand 4WD system with electronic limited-slip rear differential & single-speed active transfer case to let you take the adventure anywhere in Central New Jersey and beyond. This Jeep Grand Cherokee will thrill you and make you feel at home in the Union County NJ area. Contact Salerno Duane in Summit to learn more about the 707-hp Jeep Grand Cherokee Trackhawk today!